Cavallo World Exclusive – what is going on between Cavallo & Emma Massingale? The Gut Microbiome – find out everything you need to know! Can horse’s suffer from PTSD? PLUS WIN – SCOOTS – CAVALLO TREKS & CLB BLINGS!! Available to buy in PRINT & ONLINE. SHIPPED all over the world! If you have a horse, you’ve heard of LAMINITIS. It’s a topic we talk about a lot in the magazine and for very good reason. Laminitis and colic are the two main causes of equine demise across the globe. Whether you have a barefoot or shod horse, laminitis is never far from the minds and concerns of every horse owner I have ever met. We all have a pretty good idea that we mustn’t feed too much grass, or too much sweet feed but do we all know how to recognise those subtle signs of when too much is just too much? It’s a sad fact that many horses and ponies spend their lives ping ponging in & out of mild to serious discomfort without their owners realising the root cause and how to fix it. If the horse is footy, it’s blamed on poor breeding, weak feet, feet wearing away…rather than something as ‘serious’ as laminitis. Acute laminitis is usually quite easy to spot – horse is stiff, has difficulty moving, is sweating up, might be lying down a lot…and that’s often before anything was ever noticed going on in the feet. But it’s the low grade chronic symptoms of laminitis which are often missed. Early warning signs not to be ignored, if you only knew what to look for. We listen to professionals who we trust and tell us that “no way your horse is fine it’s not lamintiic, it just has to wear shoes because it’s feet are rubbish AND you’re doing too many miles a week to even be feasible for barefoot”. Well of course many discerning owners know that is simply a fallacy, but how many owners can truly say they know the signs and symptoms of low grade laminitis and what to do about it? Well here at the BH Mag we offer advice, support, education and real life case studies from specialists at the rock face to owner’s sharing their stories of how they brought their horse back from a dire prognosis. It’s all here across many issues of the mag. Click on SEARCH at the top of our this website and type in laminitis, you will be shown a list of all the issues where that topic appears…and you can do that for any topic such as NAVICULAR, HOOF BOOTS and DIET, to name but 3. 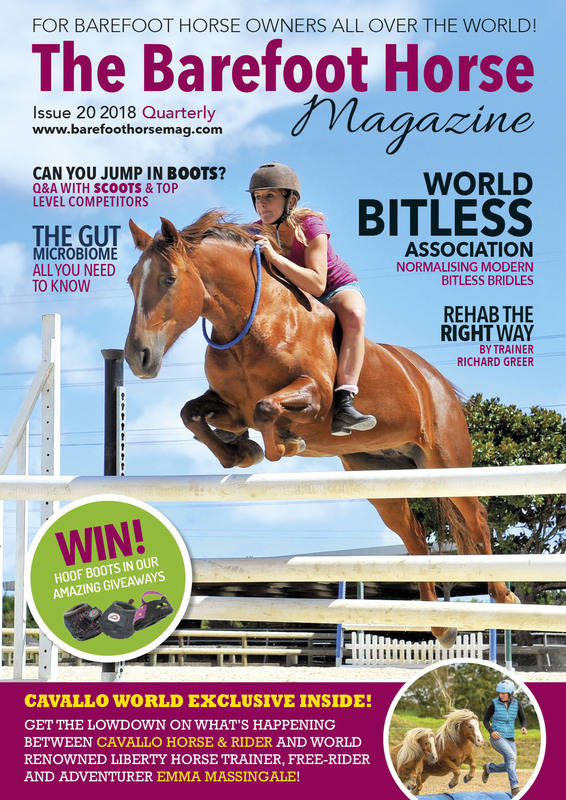 In Issue 19 we have an excellent article by barefoot specialists Hoofing Marvellous who talk about the link between diet and laminitis, one of THE most important links of all. So if you are an owner struggling to find out how others coped, here is a link to Issue 19 and don’t forget to do that smart search to find out which other issues the subject of laminitis appears in. The video below is of a beatufil brave horse called Duncan, who was diagnosed just over a year ago with acute laminitis, was shod and had been out on loan…then things went from bad to worse. NOT one vet believed he could recover, but with faith, determination and the right support, owner Jo & trimmer Emma pulled him through and just look at him today. Read his story in an upcoming issue very soon. The vid is tough to watch at the beginning but just look what happens in the end! Don’t let laminitis be the end for your horse! One of the best LAMINITIS case studies we have seen in a very long time is the one about a horse called Caio, a 9 year old Anglo Arab, who had lived and competed in Portugal as an Endurance horse, until moving to Dubai, UAE with his owner Anna. His case was an extreme example of a horse who was let down by conventional treatment and was facing a very bleak future, until his owner met Natural Hoof Care Practitioner Jan Brooksbank – then Caio’s luck finally changed. When we feature articles like this, there is nearly always a recurrent theme running through them. When the diagnosis of laminitis is finally given (and sometimes it can take several tests before diagnosis due to lack of knowledge on this subject), all kinds of treatments are used, always ranging from box rest, remedial shoeing (of all shapes and sizes and contraptions), drugs by the plenty and sometimes hospitalisation but nearly always isolation. Well Caio was no different and in the article Jan gives us a timeline of how long it took to heal him once all the conventional treatment had stopped. With some shocking photos of before and after, it is an inspirational read for anyone interested in the subject and wanting some positive and uplifting information. The picture shows one of Caio’s hooves, with the toe ‘relieved’ to expose the damaged laminae in a reverse wedged shoe – needless to say this was just one conventional attempt at trying to help Caio which of course didn’t work and the professionals then moved onto even more elaborate contraptions. This article is a stark reminder that laminitis and it’s effective treatment is so incredibly misunderstood and is one of the main reasons that many horses never make it as far as Caio did…even though his journey was a tough one, his owner never gave up once they could see him starting to improve. If you want to read this fascinating story, then it’s in Issue 17. Still available in Print & Online. Coming up soon in a future issue, we are going to feature the story of Duncan, who some of you have already met in a video we posted up a few days ago. If you haven’t seen the video of Duncan yet, check back a few posts and you will find it. His story is another extreme case of a horse being let down by conventional treatment, until his owner met the right team of people who could guide her to bring Duncan back to health again. Not to be missed, watch this space for more info on the release of that article. [vc_row][vc_column][vc_column_text]We always have great prizes to win in every issue of the mag. So what do we have for you in Issue 19? It’s another brilliant boot giveaway!